This article is about dispersion of waves on a water surface. For other forms of dispersion, see Dispersion (disambiguation). For a certain water depth, surface gravity waves – i.e. moving under the forcing by gravity – propagate faster for increasing wavelength. On the other hand, for a given (fixed) wavelength, gravity waves in deeper water have a larger phase speed than in shallower water. In contrast with the behavior of gravity waves, capillary waves (i.e. only forced by surface tension) propagate faster for shorter wavelengths. This section is about frequency dispersion for waves on a fluid layer forced by gravity, and according to linear theory. For surface tension effects on frequency dispersion, see surface tension effects in Airy wave theory and capillary wave. ω is the angular frequency (in radians per second). the wave trough at θ = 1½ π. A certain phase repeats itself after an integer m multiple of 2π: sin(θ) = sin(θ+m•2π). an implicit equation with tanh denoting the hyperbolic tangent function. which is called the phase velocity. Dispersion of gravity waves on a fluid surface. Phase and group velocity divided by shallow-water phase velocity √(gh) as a function of relative depth h / λ. Blue lines (A): phase velocity; Red lines (B): group velocity; Black dashed line (C): phase and group velocity √(gh) valid in shallow water. Drawn lines: dispersion relation valid in arbitrary depth. Dashed lines (blue and red): deep water limits. Dispersion of gravity waves on a fluid surface. Phase and group velocity divided by deep-water phase velocity √(½ gλ / π) as a function of relative depth h / λ. A sinusoidal wave, of small surface-elevation amplitude and with a constant wavelength, propagates with the phase velocity, also called celerity or phase speed. While the phase velocity is a vector and has an associated direction, celerity or phase speed refer only to the magnitude of the phase velocity. According to linear theory for waves forced by gravity, the phase speed depends on the wavelength and the water depth. For a fixed water depth, long waves (with large wavelength) propagate faster than shorter waves. with g the acceleration by gravity and cp the phase speed. Since this shallow-water phase speed is independent of the wavelength, shallow water waves do not have frequency dispersion. with T the wave period (the reciprocal of the frequency f, T=1/f ). So in deep water the phase speed increases with the wavelength, and with the period. The dispersion characteristics for intermediate depth are given below. Frequency dispersion in bichromatic groups of gravity waves on the surface of deep water. The red dot moves with the phase velocity, and the green dots propagate with the group velocity. In this deep-water case, the phase velocity is twice the group velocity. The red dot overtakes two green dots, when moving from the left to the right of the figure. For gravity surface-waves, the water particle velocities are much smaller than the phase velocity, in most cases. Interference of two sinusoidal waves with slightly different wavelengths, but the same amplitude and propagation direction, results in a beat pattern, called a wave group. As can be seen in the animation, the group moves with a group velocity cg different from the phase velocity cp, due to frequency dispersion. The group velocity is depicted by the red lines (marked B) in the two figures above. In shallow water, the group velocity is equal to the shallow-water phase velocity. This is because shallow water waves are not dispersive. In deep water, the group velocity is equal to half the phase velocity: cg = ½ cp. The group velocity also turns out to be the energy transport velocity. This is the velocity with which the mean wave energy is transported horizontally in a narrow-band wave field. The number of waves per group as observed in space at a certain moment (upper blue line), is different from the number of waves per group seen in time at a fixed position (lower orange line), due to frequency dispersion. For the shown case, a bichromatic group of gravity waves on the surface of deep water, the group velocity is half the phase velocity. In this example, there are 5 3⁄4 waves between two wave group nodes in space, while there are 11 1⁄2 waves between two wave group nodes in time. 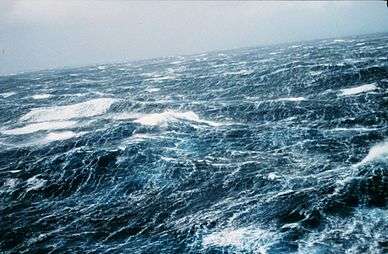 North Pacific storm waves as seen from the NOAA M/V Noble Star, Winter 1989. So in deep water, with cg = ½ cp, a wave group has twice as many waves in time as it has in space. ω1 and ω2 the angular frequency of each wave component, in radians per second. Wave groups can only be discerned in case of a narrow-banded signal, with the wave-number difference k1 − k2 small compared to the mean wave number ½ (k1 + k2). The effect of frequency dispersion is that the waves travel as a function of wavelength, so that spatial and temporal phase properties of the propagating wave are constantly changing. For example, under the action of gravity, water waves with a longer wavelength travel faster than those with a shorter wavelength. While two superimposed sinusoidal waves, called a bichromatic wave, have an envelope which travels unchanged, three or more sinusoidal wave components result in a changing pattern of the waves and their envelope. A sea state – that is: real waves on the sea or ocean – can be described as a superposition of many sinusoidal waves with different wavelengths, amplitudes, initial phases and propagation directions. Each of these components travels with its own phase velocity, in accordance with the dispersion relation. The statistics of such a surface can be described by its power spectrum. In the table below, the dispersion relation ω2 = [Ω(k)]2 between angular frequency ω = 2π / T and wave number k = 2π / λ is given, as well as the phase and group speeds. 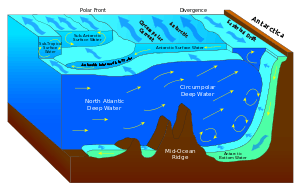 Deep water corresponds with water depths larger than half the wavelength, which is the common situation in the ocean. In deep water, longer period waves propagate faster and transport their energy faster. The deep-water group velocity is half the phase velocity. In shallow water, for wavelengths larger than twenty times the water depth, as found quite often near the coast, the group velocity is equal to the phase velocity. The full linear dispersion relation was first found by Pierre-Simon Laplace, although there were some errors in his solution for the linear wave problem. The complete theory for linear water waves, including dispersion, was derived by George Biddell Airy and published in about 1840. A similar equation was also found by Philip Kelland at around the same time (but making some mistakes in his derivation of the wave theory). The shallow water (with small h / λ) limit, ω2 = gh k2, was derived by Joseph Louis Lagrange. Dispersion of gravity-capillary waves on the surface of deep water. Phase and group velocity divided by as a function of inverse relative wavelength . 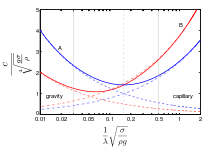 Blue lines (A): phase velocity, Red lines (B): group velocity. Drawn lines: dispersion relation for gravity-capillary waves. Dashed lines: dispersion relation for deep-water gravity waves. Dash-dot lines: dispersion relation valid for deep-water capillary waves. with σ the surface tension (in N/m). For a water–air interface (with σ = 0.074 N/m and ρ = 1000 kg/m³) the waves can be approximated as pure capillary waves – dominated by surface-tension effects – for wavelengths less than 0.4 cm (0.2 in). For wavelengths above 7 cm (3 in) the waves are to good approximation pure surface gravity waves with very little surface-tension effects. Wave motion on the interface between two layers of inviscid homogeneous fluids of different density, confined between horizontal rigid boundaries (at the top and bottom). The motion is forced by gravity. The upper layer has mean depth h‘ and density ρ‘, while the lower layer has mean depth h and density ρ. The wave amplitude is a, the wavelength is denoted by λ. So for this nonlinear gravity wave it is the total water depth under the wave crest that determines the speed, with higher waves traveling faster than lower waves. Note that solitary wave solutions only exist for positive values of H, solitary gravity waves of depression do not exist. This implies that large waves travel faster than small ones of the same frequency. This is only noticeable when the wave steepness k a is large. where k is the wavenumber vector, related to k as: k = |k|. The dot product k•V is equal to: k•V = kV cos α, with V the length of the mean velocity vector V: V = |V|. And α the angle between the wave propagation direction and the mean flow direction. For waves and current in the same direction, k•V=kV. 1 2 3 4 See Lamb (1994), §229, pp. 366–369. ↑ See Whitham (1974), p.11. ↑ This dispersion relation is for a non-moving homogeneous medium, so in case of water waves for a constant water depth and no mean current. 1 2 3 See Phillips (1977), p. 37. ↑ See e.g. Dingemans (1997), p. 43. ↑ See Phillips (1977), p. 25. Lord Rayleigh (J. W. Strutt) (1877), "On progressive waves", Proceedings of the London Mathematical Society, 9: 21–26, doi:10.1112/plms/s1-9.1.21 Reprinted as Appendix in: Theory of Sound 1, MacMillan, 2nd revised edition, 1894. ↑ See Lamb (1994), §237, pp. 382–384. 1 2 3 4 See Dingemans (1997), section 2.1.2, pp. 46–50. 1 2 3 See Lamb (1994), §236, pp. 380–382. ↑ See Phillips (1977), p. 102. ↑ See Dean and Dalrymple (1991), page 65. ↑ See Lighthill (1978), pp. 224–225. ↑ See Lamb (1994), §250, pp. 417–420. ↑ See Phillips (1977), p. 24. Dingemans, M.W. (1997), Water wave propagation over uneven bottoms, Advanced Series on Ocean Engineering, 13, World Scientific, Singapore, ISBN 981-02-0427-2, OCLC 36126836 , 2 Parts, 967 pages. Lamb, H. (1994), Hydrodynamics (6th ed. ), Cambridge University Press, ISBN 978-0-521-45868-9, OCLC 30070401 Originally published in 1879, the 6th extended edition appeared first in 1932. Mathematical aspects of dispersive waves are discussed on the Dispersive Wiki.